Framing his argument with today’s economic uncertaintly, he advocates an extensive jobs program centered around environmental related works. According to Gore, his plan would put millions to work while helping to ensure our ‘survival’ against the spectre of manmade climate change. 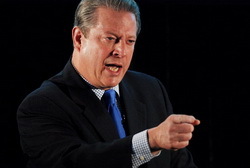 Mr. Gore advocates a number of solutions and alternative fuel sources. Interestingly enough, nuclear power is not included in his proposals despite the fact that it is one of the most powerful and environmentally sound solutions available. This entry was posted on Monday, November 17th, 2008 at 12:41pm MDT and is filed under Climate Change. You can follow any responses to this entry through the RSS 2.0 feed. You can skip to the end and leave a response. Pinging is currently not allowed. Where would we be if it wasn’t for Al Bore? We would probably be a lot richer as we wouldn’t be wasting all of our money on solving “manmade” climate change when indications are now that nature and the sun play a bigger role.